If you are lucky enough to arrive in Oban by sea, then one of the first things to strike you is the presence on the summit of Battery Hill above the town of a large structure that looks like it might have been inspired by the Colosseum in Rome. It was: welcome to McCaig's Tower, a magnificent folly that, but for the death of the man it was named after, might have ended up being even more magnificent, though at the same time looking rather less like the Colosseum. The story of the building of McCaig's Tower is a fascinating one in its own right, but over the years elements of it have grown in the telling. The starting point has to be with John Stuart McCaig, a native of the Isle of Lismore who became a successful banker with the North of Scotland Bank. McCaig was 72 years old when in 1895 he commissioned work on what became McCaig's Tower. His view of himself can be seen from the inscription he had placed above the entrance: "Erected in 1900 by John Stuart McCaig, art critic and philosophical essayist and banker, Oban." One of the aims of the project was a philanthropic one, of providing work for idle masons during the winter. As a result, work mainly proceeded during the winter months and it took until McCaig's death in 1902 at the age of 78 for the tower to proceed as far as the completion of the structure you see today. By this time it had cost him some £5,000, rather more than £500,000 at today's prices. McCaig's bequest of £1,000 a year thereafter to allow the completion of the tower was successfully challenged in court by his relatives and what we are left with is therefore what had been built when he died. McCaig's Tower is made of stone extracted from the quarries at Bonawe, on Loch Etive. It has a circumference of some 200 metres, and the wall height varies around the circumference to accommodate the contours of the hilltop on which it stands. The wall is pierced by two rings of lancet arched openings, one above the other, by a gateway on the south east side, and by a much smaller doorway on the west side that gives access to a concrete viewing platform offering magnificent views over Oban, Kerrera, Mull and the Firth of Lorn. 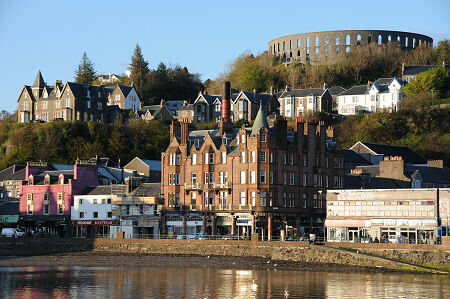 McCaig's Tower is one of two superb viewpoints on offer in Oban: the other is Pulpit Hill on the south side of the bay. 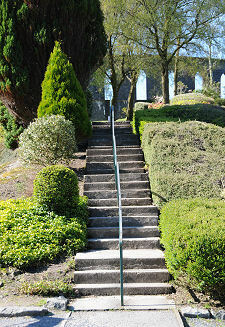 Within the circumference of the tower is a fine garden, and this is a lovely place in which to pass some time. The garden spills over on the east side of the tower, and carries on down the hillside on this side. 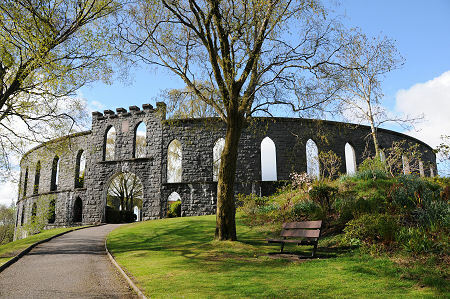 McCaig's Tower can be accessed on foot by climbing up from the town below, or by following signs through a maze of hillside roads to a parking area just behind it. What else did McCaig intend to build? We've seen it said that the intention was to roof over the tower and use the interior space for an art gallery and museum. You only have to look at the relative thinness of the walls to realise that there is no way they could support an otherwise unsupported roof without collapsing. And you only have to look at the absence of any effort to level the interior ground surface to realise that it was never McCaig's intention to have a large enclosed building on the site. A little more convincing is the suggestion that he intended to build a central tower within the encircling wall, by some accounts up to 100ft high. Perhaps this would have provided a home for a museum and gallery, though only at the cost of destroying the external resemblance to the Colosseum. Another strand of the story is that McCaig intended to place statues of himself and his family in the lancet windows around the tower. To be honest the openings don't seem large enough for the purpose, and again the walls seem too thin. And with not far short of 100 lancets to fill, he would have had to commission a large number of statues, or left a lot of the lancets unfilled.